At some point in everyone’s life, there comes a time when a miracle would come in handy. Everyone is stretched beyond his or her comfort zone. Every person is offered lessons to break free from his or her conditioned beliefs. Life wants you to stop wasting your energy and creating unnecessary suffering for yourself by trying to control how things should turn out. Life has better things in store for you: honouring your heart in ways even better and more joyful than the mind can conceive. The Oxford dictionary describes a miracle as “an extraordinary and welcome event that is not explicable by natural or scientific laws and is therefore attributed to a divine agency”. I see a miracle the same way, though in my own words describe it as “a wonderful occurrence created through means beyond logic”. I define it this way because my own experience has taught me so. Logic needs to be removed to allow miracles through. 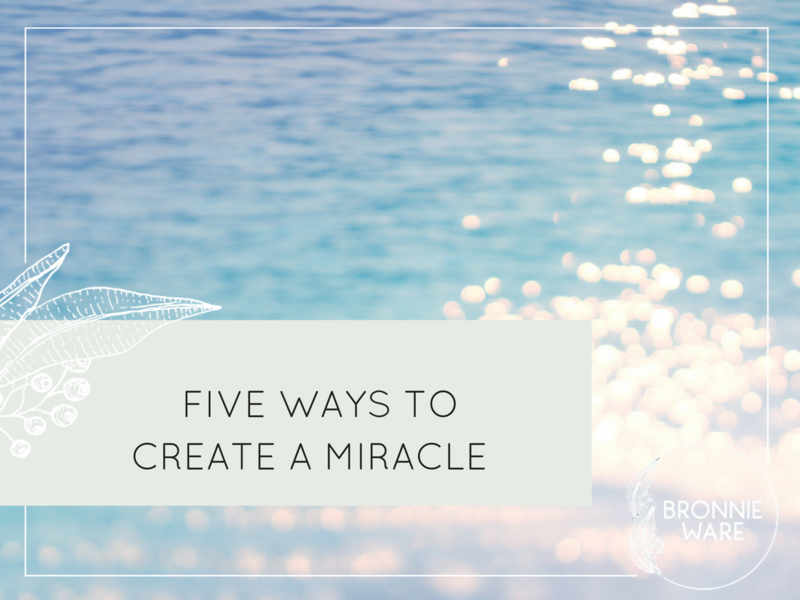 So, how do you truly create a miracle: a wonderful event that defies logic? BE WILLING TO LOOK LIKE A FOOL: If you are truly going to manifest magic, there are always lessons thrown in to dissolve the ego. You will be misunderstood. You may be judged as a fool. You will learn humility and dependence. Draw on strength from the heart and its longing. That is where the truth lies, not in how you are perceived by not knowing all the answers. The dream is possible. Your heart knows this. Tune out from the non-believers, including your own scared mind. LIVE IN THE FEELING: Create a clear vision of the feeling you wish to experience. Choose to focus on that. While you will have a visual image of how the dream may look, how do you actually want to feel? Give detailed thought to this. Define it then feel it completely, imagining it as real. Fully believe it as much as possible, not just in occasional inspired moments, but in the background of every decision you make about your future. Take your dream’s realisation into account and shape things around that. SURRENDER THE ‘HOW’: Try to bring consciousness to letting go of the logical mind. It will insist on spending its time working out how the miracle is going to land. Logic has its place. Sometimes specific action is needed. But is that action driven by clarity and inspiration, or is it driven by fear or not knowing what else to do? If it is the latter, you may actually be blocking the miracle from landing. Remember your divinity. You are a spiritual being behind (and through) your humanness. Life loves you and is on your side. Trust that things are already being put into place in the background to support you. HEAL OLD STORIES: If you are courageous enough to believe in the possibility of a miracle, you will be called to revisit and heal old stories. How else can you open yourself to receive increased blessings? Old lessons will surface. They need to. They are simply old stories, shaped by upper-limits created by your old self. They are familiar but don’t fit you anymore. They are just there to be cleared through a fresh reaction, a strengthening of your vision and dream. Recognise that, thank them, and step back into your new story. CREATE SPACE: Leave some time without an agenda. Schedule it in if you have to. Let go of problem solving for periods of time, even if just a few blocks of three or four hours each week. This can bring you to a place of joy, once you learn to relax into it, and is wonderful for your wellbeing. It also strengthens your heart to keep believing, despite the riddle of your solution appearing unsolved. A heart that is open to joy learns to treasure the present moment for the precious gift it is, making it naturally much more open to unexpected blessings. A heart given space without the stress and tangle of mental fear is a heart that recognises inspiration when it comes, sees the signposts life sends, attracts the people it needs, and dares to allow itself to receive. Miracles are what you are capable of when you dare to get out of your own way. Any lessons offered are just a loving call back to your truest self, to reconnect you with joy. Miracles may defy logic, but they are real. When timing is aligned perfectly with your readiness, a miracle can take just a moment to land. Feel the relief, excitement, and gratitude. Do you dare to receive the blessings waiting just for you? Miracles are happening every single day.